OSWEGO, NY – Oswego Speedway continues its summer stretch of action Saturday with Driver Autograph and Ovarian Cancer Awareness Night presented by JP Jewelers. Saturday’s schedule includes a 50-lap Novelis Supermodified main event as well as a 30-lap Pathfinder Bank Small Block Super feature. The Small Block Supers will revert back to running first on the schedule throughout this weekend’s racing. The second driver autograph session of the season presented by Entergy, Price Chopper Supermarkets, and JP Jewelers will be one of the many highlights of Saturday night’s action at Oswego Speedway. The second driver autograph session of the season, presented by Entergy and Price Chopper Supermarkets, will begin at 5:15 p.m. on Saturday, immediately following hot laps. 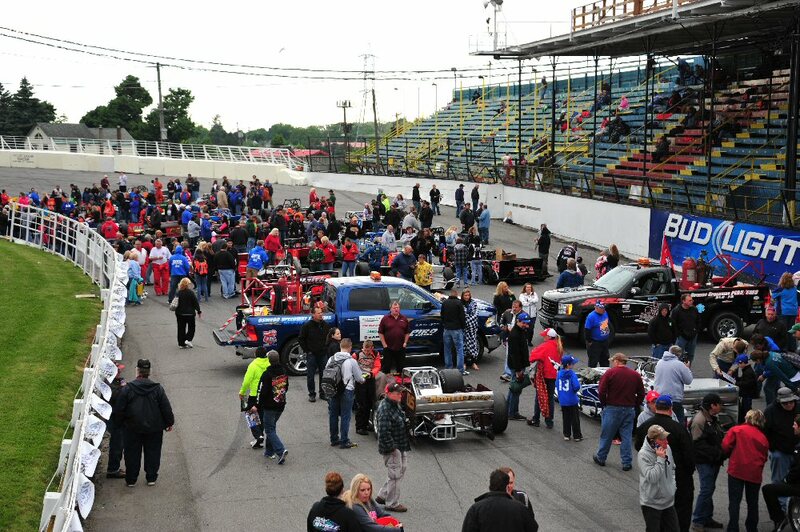 All fans are invited to come onto the Speedway’s front straightaway at that time to meet their favorite racecar drivers and get an autograph. Pathfinder Bank Small Block Super heat racing will start the night of racing following the autograph session at 6:30 p.m. The second annual Turn the Palace Teal Night for Ovarian Cancer Awareness will be ongoing through the night. As a part of raising awareness for ovarian cancer, there will be several raffles including one for a beautiful quilt made of racing T-shirts. Tickets will be on sale for this one of a kind prize. Teal Palace T-shirts will also be on sale to help turn the Steel Palace Teal on August 9. Several racecars will also be sporting ‘Teal There’s a Cure’ stickers to show support. Pit gates open at 2 p.m. on August 9 with grandstand gates opening and hot laps beginning at 3:30 p.m.
General admission seating is available for only $15 with Price Chopper Tickets to Go again available at any Price Chopper Supermarkets store for only $14. Once again in 2014, kids 16 and under will be admitted free of charge with a paid adult with active military also admitted free with ID.